B.Com General is ONLINE Through DOST. This is to inform that today 20th Feb,2019 is declared as holiday for the college due to lack of power supply in the area. Inaugural IGNOU Study Centre on 6th February. Convocation Ceremony Scheduled in Dec 2018. Click Here to Download Application Form and for further details. End Semester Examinations scheduled from 31st October Onwards. Click here for Examination Time Tables. NAAC Peer team visit is scheduled on 14th & 15th September,2018. Hearty Congratulations to Dr.G.Angela,Head,Dept of Botany and Ms.Meena Pathangey,Head, Dept of Nutrition For Receiving State Best Teacher Award from Govt of Telangana, Sep 5th,2018. 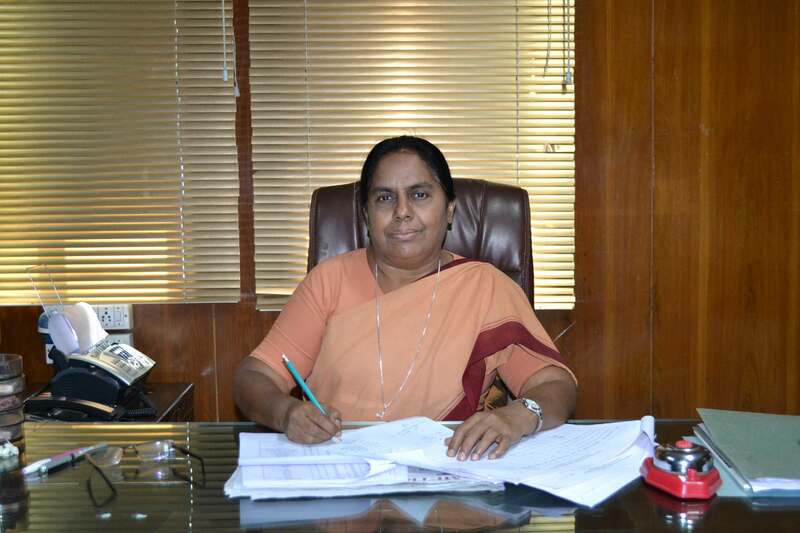 Dr. Sr. P. Amrutha M.Sc., Ph.D. 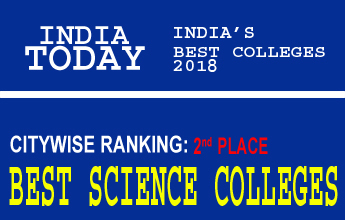 It is my pleasure to welcome you to our college website. Three thousand students flock each morning to begin yet another day of courses and lectures at St. Ann’s college. The voice of St. Anne is heard not from some voluminous pages of history but from the ongoing efforts and endeavors of the congregation of sisters of St. Anne to further the cause of women education and thus their empowerment.The college, which made a humble beginning in 1983, with just two programs, two rooms and 106 students, is today a huge institution with excellent infrastructure and three thousands five hundred and seventy students at the UG and PG level in thirty program options. Academic excellence, skill enhancement and value enrichment to help the girl student embark on life’s journey as an empowered woman. By adopting a need based approach, synthesis of academics and ethics, innovation in learning methods, and a diversified curriculum, the college aims at providing a learning environment that integrates body, mind and spirit. IQAC organizing National Seminar on "Corporate Academia Partnership - Fostering Innovation and Entrepreneurship" on 25th March 2019.Click For More Details. Centre for Women's Studies Organizing National Conference on CYBER CRIME AND VICTIMIZATION OF WOMEN CHALLENGES AND LEGAL RESPONSE On 15th March,2019.Click For More Details. 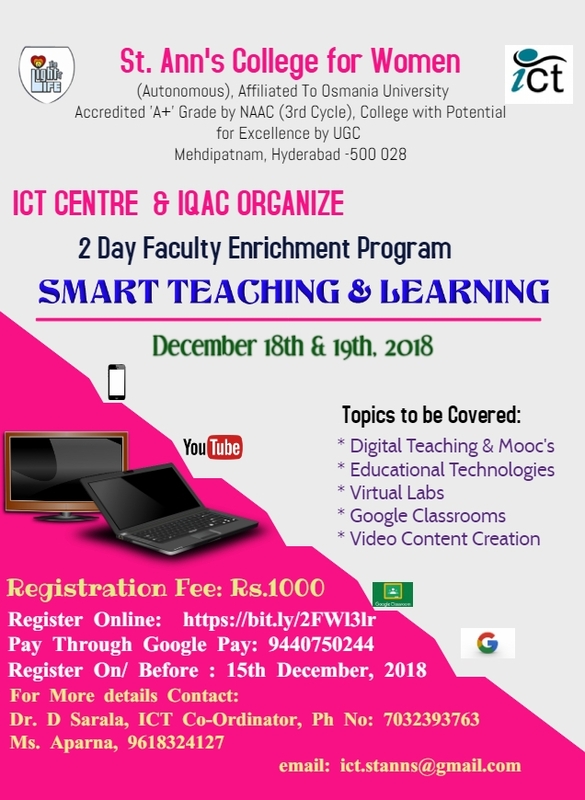 Oneday Workshop on Virtual Laboratories in Collaboration with IIIT-Hyderabad on 07th March,2019. organizing ICT Centre & Physical Sciences. The Department of Nutrition is organizing a 2 Day Seminar on RESEARCH METHODOLOGY on Feb 21st &22nd 2019.Click For More Details. Department of Genetics & Biotechnology are organizing a Two day workshop on "PCR AND ITS APPLICATIONS on Feb 20th &21st 2019. Click For More Details. Centre for Women’s Studies in collaboration with BIRDS- Human Rights Resource Centre, Bangalore is organizing two days training programme on “Human Right Education” on 15 th &16 th February 2019.Click For More Details. IQAC & Department of Commerce are jointly organizing Youth Summit 2K19- The Change Makers on Feb. 15th 2019. Click For More Details. The Department of Statistics is orgainizing a 2-day inter-collegiate workshop on 12th & 13th Feb.2019.Click For More Details. Department of MBA is organizing Management Fest Zesta-19 on 6th February 2019. Department of Botany Organizes Student Workshop on 'PLANT TISSUE CULTURE TECHNIQES'on 30th november & 1st December,2018.Click For More Details. Inter Collegiate STATA FEST - Organised by Dept of Statistics on Sep 29th,2018. Click for more details. CHEE'rs Club is conducting "Poster Presentation Competition" on 14th August 2018 in the Commerce Lab at 1.00 P.M. Theme: Freedom Struggle (Intellectual and integral) Past- Present and future. “Micro Art Attack” - Competition by Department of Microbiology on 21/7/2018.